Acid leaks during storage and transportation are not contained posing several threats to human health and the environment. The sulfuric acid electrolyte contains high lead levels and other toxic heavy metals. Lead is one of the most toxic substances to human health with the World Health Organisation currently suggesting there are no known levels of lead exposure that are considered safe. The acidic electrolyte can also result in burn injuries, damage to property and the environment. The onerous packaging requirements contributes to the on selling of batteries from smaller scrap companies to larger companies, in order to avoid this task. This manual double handling of heavy batteries is an additional OH&S risk and increases leakage of electrolyte into the environment. Variations in the worker’s attitude and training. Packaging of batteries on pallets is time consuming, difficult and unsafe. Required materials & tools not available (good quality wood pallets, plastic wrap, strapping tool, 30mm card separators, straps for load restraint). Use of cheap, poor quality wood pallets (to save costs). Batteries of many different sizes are difficult to stack securely on pallets. Systemic non-compliance of used lead acid battery transport regulations, specifically battery packaging and load restraint requirements, is increasing the risks to the public and environment in the event of an accident and results in load shifting & acid spills during transport. 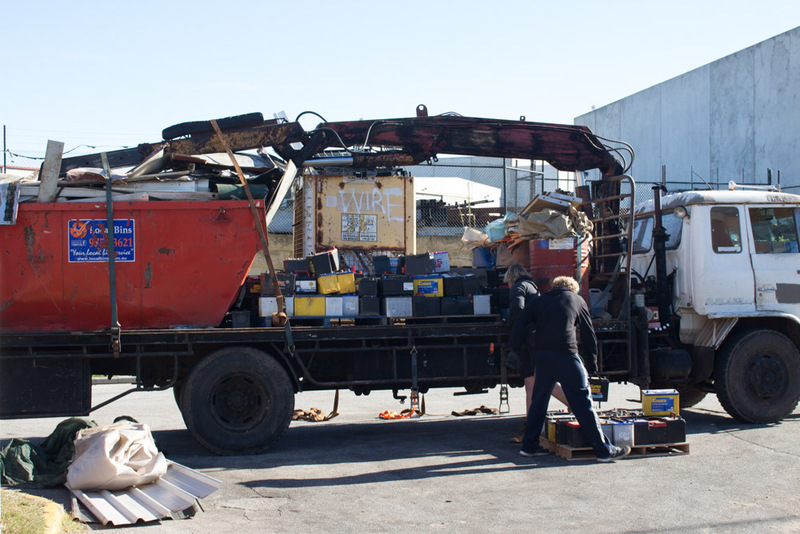 Dangerous transportation of Used Lead Acid Batteries without any packaging and unsecured from Regional WA to Perth. With the increased availability of plastic boxes of suitable strength and capable of retaining any acid leaks, Battery Rescue believe it is time the industry moved away from the use of wood pallets to store and transport used lead acid batteries and have outlined in our white paper “Creating a safer and environmentally sustainable used lead acid battery recycling industry” how this can be achieved. We believe the Australian Government should provide regulatory support to eliminate the use of wood pallets.